Differences in repair estimates are not uncommon. Unfortunately with differences in training, experience, equipment and material quality, there often are large differences in initial estimates to repair a damaged vehicle. This fact, in addition to the added complex systems in newer automobiles all add some uncertainty to the final repair costs. A lower estimate may not include all the necessary parts and procedures that will be needed for a full and complete repair. We are always available to explain our estimates and prices in detail. “The finest in collision and paint repair” from a major collision to a parking lot ding or a full on repaint we can handle it all…with a lifetime guarantee! Oil changes, alignments, brakes, tires, shocks, belts, winterizing, fluid flushes. Having these services done while your collision damage is being fixed is just another way of being the finest in automotive care. 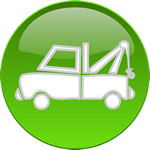 Damage free towing to the shop for repairs…call for dispatch. Whether you need a bug shield for a truck or a style wing for your car we can handle them all. Commonly known as PDR, removing small dents and dings without painting. Either fixing that bulls-eye or full glass replacement we have same day turn around. If we don’t have a car available we have worked arrangements with other rental companies to get you on the road. From pop-up to Prevost, we handle it all. Washburn’s is one of the only shops to accommodate rigs up to 50 feet.